Listen to Chinese music. 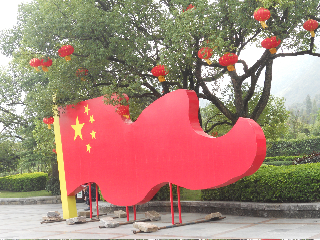 Check out Music from China (click on sample our music) for a great selection of different Chinese music for students to sample classical, folk and more. Probably, the most famous historic structure in China is the GREAT WALL. The pictorial book, The Great Wall of China by Leonard Everett Fisher, is a great way to introduce students to this unique man made structure which can be seen from outer space. Built entirely by hand, this wall snakes up mountain ranges, down into valleys and across deserts of northern China. The wall is the longest structure ever built and stretches close to 4000 miles. It was built as a defense against invaders from the north. Some of the walls originate to 400 BC. Around the years 220 BC, the emperor Shihuangdi(Ch�in) began the huge undertaking of connecting the many different walls. According to an excellent video, The Great Wall and Today�s Beijing, Video Field Trips 1988, enough dirt and stone were used in the construction of the wall that it could circle the earth with an 8ft high wall! Student could write a creative composition pretending to be a worker on the wall which is also nicknamed the 'largest cemetery in the world'. (That�s because if a worker died, he was buried in the wall!) Check out Enchanted Learningfor some photographs and information on this amazing structure. Have students go to Travel China Guide on terra cotta soldiers. Students can record 4 cool facts about the tomb of Shihuangdi and then create a postcard to a friend or family member with the four things they learned from the site. The Chinese gave the world many gifts. They were the first to use paper money, eyeglasses, umbrellas, waterproof clothing, silk and invented a harness and stirrup for the horse. They also were the first to use coal for heating and made cloth from the cocoons of silk worms. They also used kites(originally as a form of communication), made compasses from lodestone, printing blocks, paper, yo yo, and gunpowder(originally used in firecrackers not weapons). Some people also say the first windmills were erected by the Chinese and not the Dutch! The Chinese were the first to use 'paper' as we know it. Silk was very expensive and bamboo, another material used, was too bulky to use. Ts�ai Lun experimented and after many years found that if you soaked the inner bark of a tree(he used the mulberry) in chemicals, pressed it and dried it, that you could write on it. Eventually, other things such as old rags and fishing nets replaced the tree bark. The Chinese kept the idea of paper making a secret for hundreds of years until it is told that two European monks sneaked the secret of paper making back to the west. Try making paper with this recipe found at this site: Ehow-Steps to making paper Have students try writing Chinese with Q tips and 'lampblack' ink on homemade paper or regular manilla paper. Using a lighted candle, have students carefully cover a plate with soot. The ancient Chinese called this 'lampblack'. Instead of mixing tree sap with the soot as the Chinese did, add a bit of vegetable oil. Read about the history of the Fortune Cookie and try making them in class. I�ve included a recipe found on the internet. I tried this one year(the cooking experience was lots of fun) but it�s much easier to purchase them from a Chinese restaurant! 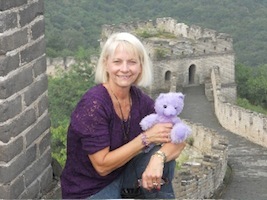 Check out my, Let's Explore China Unit/Resources at my TpT Store: Let's Explore China!